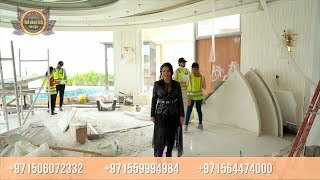 The grand and majestic villa project in Abu Dhabi is a masterpiece of creativity of talented interior designers from design studio Luxury Antonovich Design. The interior, which can be enjoyed forever. The interior, which gives a sense of aesthetic pleasure. The interior, about which you can write a poem or a symphony. A large and close family with aristocratic roots is lucky to have such a luxurious villa interior Abu Dhabi. Interior designers skillfully twist the classical style, Baroque and Rococo, complementing the subtle hints of Oriental style. The floor is made of natural marble with carved patterns, like a painting of a great artist. Thr floor on the ground floor can be admired from the height of the balustrade of the second floor. A delightful fireplace composition looks luxurious. Majestic image of the interior is complemented with rich decor of walls and ceilings. Interior designers perfectly organized a large spaceof the house, emphasizing the benefits of the architectural plan. The interior design combines stunning grandeur of the palace with the warmth of contemporary comfort. Furniture upholstered in noble creamy velvet and luxurious drapes of silk in soft blue hues look home-warm and cozy. Massive crystal chandelier fills the interior with festive mood. Noble status of respectable apartment is perfectly emphasized with the art of painting in the decoration of the walls and ceiling in the best traditions of the Renaissance. The interior design from the studio Luxury Antonovich Design is a fine art that will go in history and will delight more than one generation.